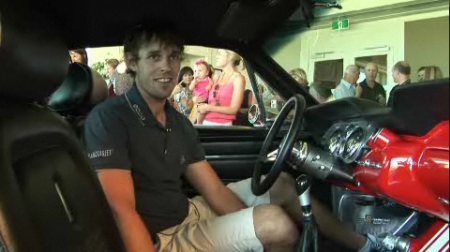 It seems golfer Aaron Baddeley is a Mustang fan and he now has his own custom restomod, complete with his nickname in the paint to prove it. Aaron’s dad Ron Baddeley project managed the resto with help from the team at Slamed Creations, taking inspiration from the movie, Gone in Sixty Seconds, to build a one-of-a-kind Mustang. The team unveiled the car at the opening of Croydon Golf Courses’ back 9 as a surprise to all in attendance. The car was soured in Australia and custom build from ground up. The car takes it’s stylings from Eleanor but is very unique and different, especially with the interior and custom dash. Check out the VIDEO HERE. I wish my dad would build me a car as a gift! I just don’t understand why you would go into so much detail with a build but still have non functional side exhausts and making it so obvious as there is not even exhaust tips on it.. But it looks great otherwise ! How about your build cam ? It’s been too long without any news !